It’s been slim pickings here at the blog for a while now so I thought I might as well post something rich and decadent after a-ummm-how shall I put it across? A blog-fast? A locked pantry? We celebrated my husband’s birthday this month, and every year, he asks for a chocolate cake. He likes cheesecake and loaf cakes and citrusy oil-based cakes as well, but when it comes down to the kind of cake he’d like to cut on his birthday, it must be chocolate. Clean. Classic. Simple. Elegant. And if there’s one cook out there who has chocolate cake recipes to suit every kind of palate and occasion, it’s Ms Lawson. Need a fancy cake? Torta alla gianduia from How To Be A Domestic Goddess. Need a cake that’s less dense, but looks difficult and laboured over? Chocolate cloud cake from Nigella Bites. Need something sophisticated and served individually? Molten chocolate babycakes. Gluten-free? 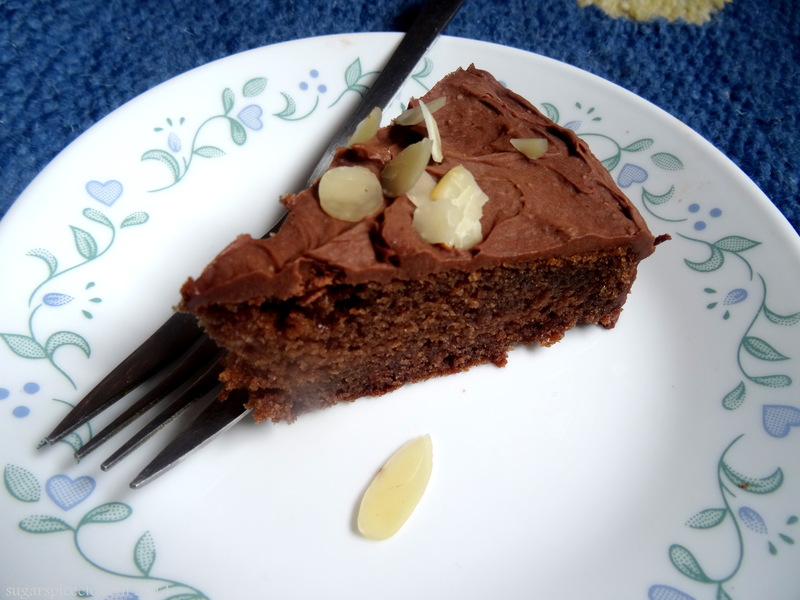 Nigellissima’s Chocolate olive oil cake! So you see, she has something for the children, something for the chocoholic, something for the gluten-intolerant. I picked up a copy of Nigella Bites a month ago, it was a nice hardcover edition, plus it was on sale. I know the number of recipes is limited compared to say, a How To Eat, Feast, or Nigellissima, and I’m well aware that almost all her recipes are available online (either on her website or a food blogger’s,) but the offer was too good to resist. I’d flipped through a copy of Nigella Bites it in a bookshop and quite liked it. (Yes, I’m one of those people- I’ll browse in a bookshop and buy it on Amazon or Flipkart if it’s cheaper there.) I have HTBADG, but I like Nigella Bites because it’s slightly different from the others- fewer recipes, but more step-by-step pictures, and a page after each chapter for notes, so you can scribble your observations and notes to self. Okay, I’ll say it now- I am a Nigella convert. I’ve been quite open about my contempt for her in the past, but as I browse through more of her books, I began to see why she’s so popular: the pretty prose aside, she does tend cook to like many of us would at home. (I use stock cubes and frozen peas myself.) While I may not be making her ham in Coca Cola anytime soon, there are plenty of other things I can attempt, from involtini to orange breakfast muffins and Vietnamese chicken salad. And even if I don’t end up making all of the recipes, I don’t mind- like having cookbooks to hold and read! Actually I love collecting cookbooks. I read them like I would a novel, going through recipes and techniques before bed each night, drawing some kitchen inspiration and figuring out how I can use the ingredients I have in a new way. So most nights, before I sleep, I’ll flip through a cookbook in bed. I’ll just pick a book off my bookshelf, based on how I feel- and I’ll read a recipe or two like a bedtime story. Marcella Hazan’s tips on how best to store basil. Felicity Cloake’s recipe for perfect gazpacho. Amanda Hesser’s baked zucchini with herbs. Ritu Dalmia’s marinated eggplant sandwich recipe, or one of Nigella’s many, many muffin or cake recipes. More than the recipe itself- “…in a bowl sift together flour, salt, baking powder..,” I like reading the notes preceding a recipe. What inspired it, who it’s borrowed from, a special meal it was part of, how the author has added her twist to it. I’ve come across other bloggers who do the same- and I wonder- do you curl up with a good cookbook? And why? For the prose, meal planning, or just to take in the beautiful photography? Sometimes I wonder if I think about food a little too much: right now, I’m thinking about how to prepare a bowl of wheatberries, currently soaking. And this brings me back to Ms Lawson. She claims to have her mind on food almost all the time, and she’s unapologetic about it. And her recipes too, are straightforward and unapologetic about how they came to be. 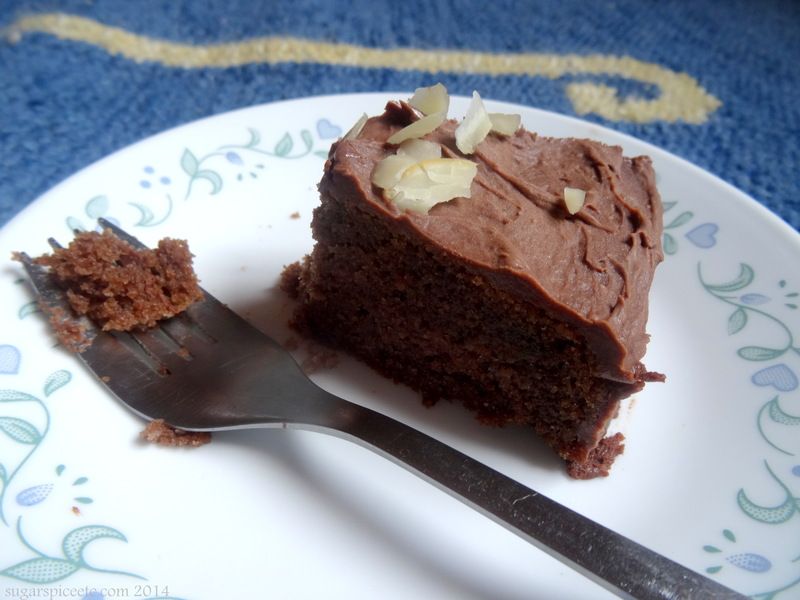 This chocolate cake is chocolate cake at its simple, uncomplicated best. No 70% dark chocolate to be melted, just good old-fashioned cocoa powder, flour-butter-sugar-eggs. The way the ingredients are combined differs from some of Nigella’s other chocolate cakes, but it yields a spongy and light cake with a creamy, sweet and slightly tart frosting. It’s got more body than buttercream, so it holds up well, and it’s a nice contrast to the spongy cake. I halved the recipe to make just one layer. I also substituted some ingredients, which I’ve added in brackets. Grease and line the bottom of two 8-inch sandwich tins. In a large bowl, whisk together the flour, sugars, cocoa powder, baking powder, baking soda and salt. In another smaller bowl or measuring jug, whisk the eggs, sour cream and vanilla until blended. In a third, large bowl, beat the melted butter and corn oil until just blended, then beat in the water. Add the flour mixture at once and beat well. Add the egg mixture-sour cream mixture and continue beating till everything is well combined. Melt the chocolate in the microwave or a double boiler. Allow it to cool slightly. In another bowl beat the butter until it’s soft and creamy. Add the sieved icing sugar and beat till light and fluffy. Then add the vanilla and melted chocolate and mix until everything is glossy and smooth. To assemble, sandwich the middle of the cake with 1/4 of the icing, and spread the frosting over the top and sides. Nigel Slater’s Kitchen Diaries (and both his ‘Tender’ books, while we’re on the subject) are wonderful to read before bed, as if they were novels. The story about the recipe is at least as important as the recipe itself. His writing is so evocative – in a totally different way to Nigella’s (I love her too, but for different reasons) – you can feel the seasons change in his books. Hey thanks for commenting! I have Slater’s Toast, which was a heartwarming book 🙂 Kitchen Diaries has been on my Amazon wishlist for a while, I’ll definitely get it now that you’ve given it such a good review!! You will not regret it! Both are absolutely great, though I’d lean towards the first one. OMG I do the piling up part when I go to my parents house! Mainly because my room back home has a large-ish bedside table. I think it’s the best way to fall asleep, with a cookbook! Haha thanks! The frosting itself is decadent enough! Uruuuuuu!! Thanks. I actually sat with a spoon and ate the rest of the icing- it’s that good!